Representatives from Gallia County Local and Gallipolis City schools gather in Bossard Memorial Library to discuss an upcoming event dedicated to unity and to denounce acts of violence. GALLIPOLIS — Many have led in their lives, but when was the first time you were asked to lead? 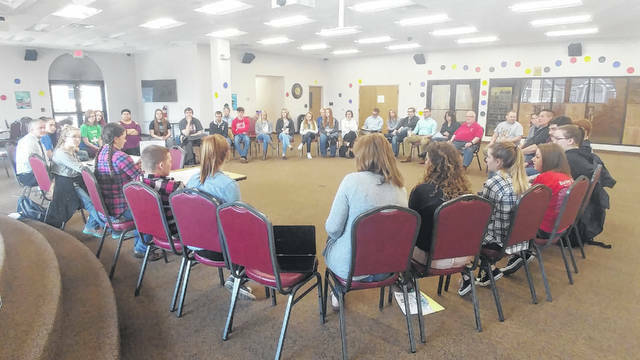 Some Gallia public school students experienced just that Friday morning as school administrators and community members asked them what they would like to see out of an event that has been geared towards uniting the community in a message against violence and reaching out to those who might feel isolated. Community members began organizing shortly after the Parkland Florida Shootings with concern for the overall state of violence in society and mental health, especially in schools. Members began reaching out to school administrators with a desire to speak with students and ask them their opinions on violence in society. Gallia’s three public high schools joined Friday morning at Bossard Memorial Library with student leaders, encouraging students to share their opinions and visions of how such an event should be executed. Both Gallipolis City Schools Superintendent Craig Wright and Gallia County Local Schools Superintendent Jude Meyers said it was one of the few opportunities in recent memory where the school districts could combine for a greater cause and the administrators agreed on the importance of the initiative. Stack said of the conversations, students expressed a need for the community to unite and the event should not be a “one-time” incident. More organization and planning needed to be continued into the future. The current event is slated for April 20 in Gallipolis City Park. Some students voiced that they wanted others to be more open-minded and to respect others who may be following less traditional paths academically. Students voiced the importance of having trusted adult figures in the community who understood that making mistakes was a part of growing up and that harsh discipline was not always an answer for learning. Students also expressed a desire for “tough love” conversations at times though. Students would eventually split into four groups and gather in the corners of the Bossard Riverside Room to discuss their interests in organizing the upcoming event. Some gathered to discuss entertainment and speakers, some gathered to discuss logistics and supplies and others gathered to discuss reaching out and mental health issues. Any interested in assisting the event can direct their donations to Saint Peter’s Episcopal Church in Gallipolis. The organization will be acting as a local financial agent and offers a donation to be tax deductible with the assurance that the event will remain inclusive and apolitical. The church may be contacted at 740-446-2483 or at fr.aj.stack@gmail.com for more information.